I am so glad to have found The Wasp Expert after searching online for someone to help with the removal of flying insects. My panicked call in the evening was returned the same night by Chris. After describing what was happening, he diagnosed that I had yellow jackets that were building a home in between an exterior and interior wall. He answered all of my questions and set an appointment to come out. When Chris arrived he was ready to tackle the problem. He kept me updated along the way as to what he found and was doing. I was able to see what was actually inside my wall when it was removed. He sealed the area they were entering from as well. I am relieved and thankful they are gone! I am also happy no toxic chemicals were used in the process. Chris was prompt and professional in treating the issue. From my initial phone call to the removal, his knowledge and calmness put me at ease. I highly recommend The Wasp Expert! We had a huge Hornet’s nest underneath an awning near our basement door. We had a contractor scheduled to replace the door in a few days so we needed prompt attention. I left a message for the Wasp Expert on Sunday morning. I was very pleased that Chris, The Wasp Expert, returned my call that same day. He scheduled to come out that Tuesday. Chris demonstrated an appreciation of the value of my time as well as his when he had to postpone the job due to heavy rains that afternoon. He took the time to call us early in the afternoon, explained why it would not be a good day and rescheduled for Wednesday. That little act saved me leaving work early wasting my time. Chris came out promptly the next day at the scheduled time and removed the hornet’s nest. The nest was the size of a basketball but it was promptly and completely removed when he finished. He was very professional and did not use any toxic chemicals. This was important as we have dogs we did not want exposed to any residual material. I can’t thank Chris, the Wasp Expert, enough and highly recommend his services with the various bee issues you might experience. After a few attempts at vacuuming the wasps out of a nest in my basement, I called in a professional. I found Chris’ videos on YouTube, noticed he was in my local area, and from the talk we had on the phone, I found out that he was very personable and offered reasonable prices. We scheduled a time to meet, and he brought his expertise to the project. I initially thought I had wasps coming in from two nearby locations, but Chris quickly pointed out the two different species of wasps and the types of hives they were building in my home. I was thoroughly impressed with the work he performed and look forward to recommending his services to other potential customers. 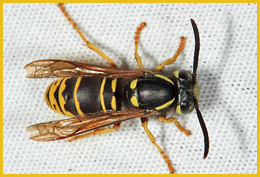 We called the Wasp Expert for an emergency removal when a yellow-jacket wasp nest was found above the insulation in our basement storage room ceiling. The wasps entered through a small external foundation hole provided for conduit. Chris responded immediately and was onsite within hours. He spent his Friday evening evaluating the issue, diagnosing the problem, and REMOVING THE WASP NEST – 100%. Chris is a real expert, knew what to do and got right to the issue with minimal disruption. His courteous, expert service is 2nd to none, and his fee was more than reasonable. We couldn’t have ask for a better outcome. 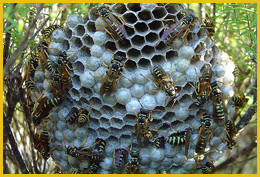 Go to Chris the Wasp Expert first before you consider alternative, high-priced extermination services that are willing to schedule a visit days later as the nest grows and wasps invade your home. Thanks Chris for your outstanding service – you’re the only call we’ll make the next time unwanted house guests are spotted! We noticed an underground wasp’s nest near our deck/children’s play area. We were concerned with our kids being stung and when researching solutions found that most consisted of using harsh chemicals. We found Chris online, called him Saturday evening and he was at our house on Sunday morning to address our issue. He was courteous and professional and clearly knew his craft. Within an hour our wasp problem was no more. His process was completely chemical free – giving us comfort that our kids would be able to play in the area of the nest without being exposed to any toxic insecticides – and at a better price than other options. I would highly recommend Chris’s services and will be sure to call him again should wasps return to our yard. of a bedroom , to our horror they were actually coming in through the ceiling! and removed the nest and bees with no disruption to us. I liked the fact that he eliminated the problem without using poisons , as we have 2 small dogs. I am thankful we found Chris , and I would absolutely recommend him for any bee / wasp / hornet problem you may have. Thanks for a great job Chris! Chris came out the next day after calling and describing our problem with yellow jackets. Chris was well prepared with his protective bee suit, and took care of the problem using no chemicals or pesticides. There was a large nest under a temporary wooden step, and he removed the nest and bees and they have not returned. Would highly recommend Chris for any bee issues. Chris came out at short notice to take care of a hornets nest that had grown over the year. Several hundred hornets. He was prompt, professional and knowledgeable. He took care of the nest with no issues, no chemicals, and helped me understand how to take care of some yellow jackets that were in another area of the garden. If I have an issue in the future, Chris is the guy I will call. You came out to remove the hornet’s nest from our house. You had asked for a testimonial which I am happy to give. You did a great job and removed the nest safely and quickly without any bother or danger to our family or house. I’d recommend your services to anyone. I just wanted to say thank you so much for removing the yellow jacket nest from our yard. Since my husband is allergic to bees, and I have a young son running around it was very important that we got the nest out of here ASAP. You were very fast to respond, and you did a fantastic job. It was great not having the chemicals sprayed everywhere! Plus the dug up nest was pretty interesting to look at. 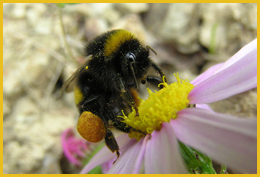 We will definitely be calling you again for any future bee removal. Thank you so much! I just wanted to say thank you again for coming out to remove the yellow jacket nest in our yard. My wife and I really like the fact that you did not use any chemicals to remove them so that we were still able to use the firewood around the nest once it was removed. Most of all we appreciate you coming out within 24 hours of us contacting you. Because of your prompt response and thoroughjob, we were able to host our party without worrying about any of our guests being stung. 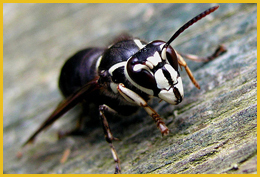 We will certainly be recommending you to any of our friends who are in need of wasp removal! I wanted to reach out and say thank you for coming out to our home and successfully removing the very large wasp nest on our front porch. We are very appreciative of your professionalism and quick attention to help us out, as my wife is allergic to wasp stings. It was amazing how you were able to get rid of the wasps without using pesticides or harmful poisons. Just wanted to say thank you for your most recent visit to remove the wasp/ hornet nest from our home. Also, for anyone considering using you, please list us as a reference. You have been great work with, it is rare these days to work with someone that has the knowledge, capability and professionalism that you have shown both times you have successfully removed bees and wasps from our house. We live in a rural area and having nests is something that you would have to expect but the size and location of these nests presented a problem to our young children playing around them. Having the peace of mind that they have been safely removed is a tremendous value and your fee is more than fair for what you do for us. So, if anyone is reading this, hire Chris you won’t be disappointed!! !